Horse Of The Year - Shartin N or McWicked? Now that the 2018 harness racing season is drawing to a close, the debate over whether McWicked or Shartin N should receive Horse of the Year honors is boiling over. Both are incredible racehorses coming off of career seasons. Both are deserving. Only one will win the honor! What is amazing is that in a year in which the 3-year-old trotting filly Atlanta (by Chapter Seven) achieved the rare feat of beating the colts in the Hambletonian, and the 2-year-old trotting filly and colt champions both went undefeated and appear to be budding superstars (both by Chapter Seven), that it is a foregone conclusion that Horse of the Year honors will go to Shartin N or McWicked. Shartin N (by Tintin In America who is by McArdle) raced 24 times in 2018, winning an amazing 19 times against a stellar group of North America's best pacing mares. No horse or mare won more races in 2018! She won over US$1,098,000, an amazing feat for a natural 4-year-old until late October of the year! This is even more special given Shartin N only arrived in North America from New Zealand in December 2017. She raced from mid January thru late November, always at top form....a training achievement that should afford the Jim King Jr. and Joanne Looney King training duo accolades they richly deserve. In two of the five losses, Shartin N broke at the start, in another race she choked - each time fighting early driver restraint. So Shartin N was only beaten twice in 2018 races in which she got away cleanly! McWicked (by McArdle), a 7-year-old, raced 19 times in 2018, with 11 wins, for 2018 earnings of over US$1,662,000. 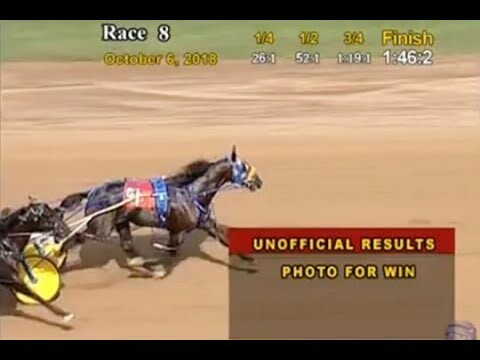 He raced and won on all size tracks against the best free for all horses in North America. He dominated much like Shartin N dominated! He raced from mid May thru late November, a shorter season than Shartin N's but a full and tough campaign. Trainer Casie Coleman managed him exceptionally. Shartin N's best winning time was 1:48.2 at Lexington, McWicked's was 1:46.2 at Lexington. So which horse deserves more the award that each deserves?? It is so hard to say! Perhaps the slight edge goes to Shartin N because, as a true 4-year-old mare racing against more seasoned and accomplished North American mares, she did what few have been able to do. Perhaps also the level of competition that McWicked faced was unusually light compared to typical North American FFA years. Lazarus N was only himself for a few starts and beat McWicked twice and the rest of the group had seen their best days or were just not truly top class....perhaps what Shartin N did was historic, while what McWicked did was merely dominant....But FFA is more high profile than is the pacing mare division and historically voters favor the FFA Star, renowned trainers like Casie Coleman, and horses with prior records of stardom! WHICH WAY WOULD YOU GO? ?